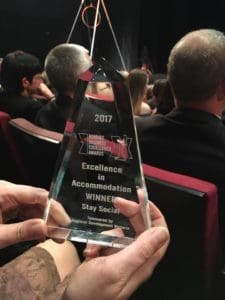 Stay Social has received the 2017 Award for Bendigo Business Excellence Accommodation! 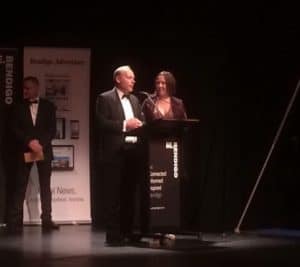 We are thrilled to receive this Bendigo Business Excellence Accommodation award. 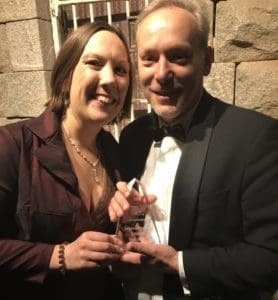 Being recognised for creating a business that provides great service and lives and breathes our values of social and environmental sustainability. Thankyou to the judges and category sponsor Regional Development Victoria. For acknowledging our approach to make a change by providing an inspiring, unique and comfortable accommodation for Bendigo. The Bendigo Business Excellence Accommodation Award means so much to us, giving us the credibility that Stay Social is the place to stay. Especially for businesses and travellers who want that sense of a “home away from home”, and connect with all that Bendigo has to offer. This award would not be possible without our dedicated team, supporters and all our wonderful guests who love our place and leave us amazing feedback. For those in Bendigo that know people who need accommodation please refer them to Stay Social. They will absolutely love it!! Found the place wonderful and resting after working all day. Very secure place always felt safe, clean with the home feel to it. Will be staying on a regular basis, the sunroom and chickens were wonderful. The barbeque was easy to use and had a wash basin right next to it. In comparison to a hotel which is just a room with t.v stay social was great. This is a unique place that is fresh, new and cared for. Located within walking distance to cbd bendigo and its attractions. The house has spacious communal kitchen, dining and outdoor areas for relaxing with other guests if desired. Even pushbikes, chickens and play equipment to entertain. The rooms are compact, secure and private if that is what you desire. Definitely a stay with a difference for individuals or a group.